Lived c. 100 – c. 170. Claudius Ptolemy wrote the Almagest, the work that defined astronomy for over 1,000 years. The Almagest included a catalogue of over a thousand stars, recording their positions, constellations, and relative brightnesses; and a mathematical model predicting the movements of the planets. The predictive power of Ptolemy’s planetary model was unsurpassed for almost 1,500 years. Claudius Ptolemy was born in about the year 100 AD, almost certainly in Egypt. He lived in the metropolis of Alexandria on Egypt’s Mediterranean coast. 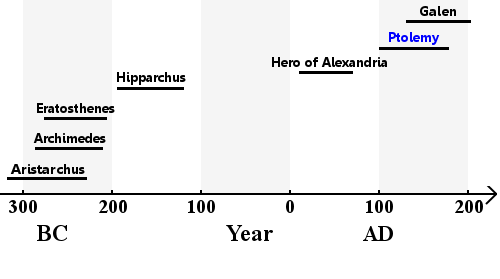 Alexandria was built by the Ancient Greeks, but later conquered by the Romans. Claudius is a Roman name and Claudius Ptolemy was a Roman citizen. Ptolemy, however, is a Greek name and Ptolemy wrote in Greek. He was possibly related to the Greek Ptolemy royal dynasty, ousted by the Romans in 30 BC. There is, however, no direct evidence to support a relationship. We do not know what Ptolemy looked like. Images we have of him were first created over a thousand years after he lived. Ptolemy’s most famous work is the Almagest, an astronomy textbook and star catalogue. The Almagest was a substantial, ambitious work. It taught its students how to predict the location of any heavenly body at any time from anywhere on Earth using Ptolemy’s mathematical model of planet movements. Ptolemy presented his model’s output in the form of data tables. Using his tables, one could also predict eclipses. Ptolemy first entitled his book Mathematical Treatise. Almagest is a later fusion of Arabic and Greek words – ‘Al’ is Arabic for ‘the’ and ‘megiste’ is Greek for ‘greatest,’ the title indicating the books status in astronomy. To create the Almagest, Ptolemy assembled observations of the heavens spanning many hundreds of years, beginning with data compiled in Babylon in 747 BC. He used state-of-the-art mathematics to analyze and interpret the data to create his model. Religion and Aristotle’s physics are guesswork: only mathematical proof provides certainty. The heavens move like a sphere. The earth and the heavenly bodies are spheres. The earth does not move from its position at the center. The earth’s size is insignificant compared with the universe and, mathematically, the earth can be treated as a point having no volume. There is some merit in the idea that the earth rotates through a complete circle once a day. However, our planet would have to spin so quickly that the effects would be noticeable. Therefore, the earth is stationary and the heavens move. There are two types of motion in the heavens: the stars moving steadily; and the sun, moon, and planets moving in a more complex way. There is no up or down in the universe. What is above us in the heavens depends on where we stand on the earth’s spherical surface. In Ptolemy’s time electronic calculators lay almost two millennia in the future. To help budding astronomers with their calculations, Ptolemy offered them a large table of chords. Chords are used for trigonometry calculations: they are closely related to sines. Ptolemy probably got his table of chords from an earlier Greek genius: Hipparchus. Ptolemy proposed a universe consisting of nested spheres containing the heavenly bodies. He incorrectly placed the earth at the center of the universe. He correctly showed the stars as the bodies farthest from Earth. He incorrectly showed Mercury as the planet closest to Earth. In the Almagest’s star catalog, Ptolemy provided the coordinates and brightnesses of over 1,000 stars and placed them in 48 constellations. Modern scholars believe Ptolemy assembled much of his star catalog from an earlier one compiled by Hipparchus. Although the stars seemed to move with reassuring predictability, the paths of the planets in the night sky were harder to forecast. The very word ‘planet’ comes to us from the Greek word for ‘wandering.’ The Greeks called the planets ‘aster planetes’ – wandering stars. 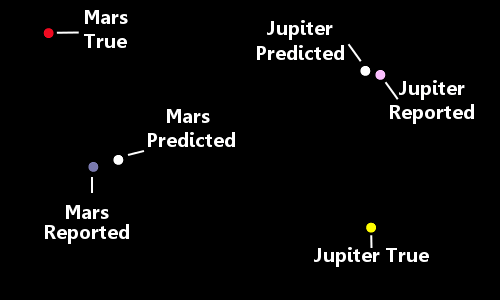 Below you can see Mars’s path as seen from Earth over a period of about 8 months against the fixed background of stars. Mars, of course, does not really change direction and go backwards. To an Earth based observer, the paths followed by planets look strange. When a planet seems to track backwards it is said to undergo retrograde motion. We see this happen only because we are on a rock orbiting the sun watching another rock in a different orbit around the sun. The two rocks’ relative velocities and locations are changing. When our planet passes Mars, Mars appears to move backward in our night sky – the jargon term is retrograde motion. If we could travel in a spaceship to a privileged position outside the disc of the solar system, the picture would look much simpler. 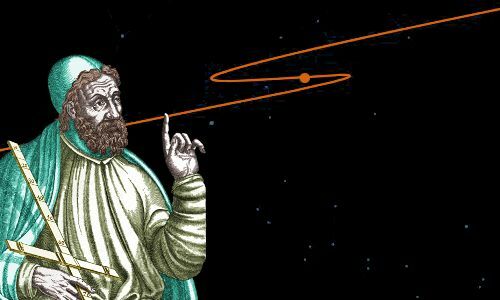 We would see the planets moving in elliptical orbits around the sun – a fact that was discovered by Johannes Kepler in the early 1600s. The orbits of the planets look much simpler looking from outside the plane of the solar system than when viewed from the surface of the earth. It is obvious to anyone who watches the night sky that the planets grow brighter and dimmer, implying their distances from Earth change. However, the Greeks were insistent that the only movement possible in the heavens was circular. Unfortunately, strict circular orbits centered on the earth would not allow the planets’ distances from the earth to vary. Appolonius of Perga thought about the problem and came up the concepts of the eccentric, the deferent, and the epicycle. Hipparchus implemented Appolonius’s ideas, modelling the movements of the sun and the moon with moderate success. The first idea was to place the center of a heavenly body’s orbit at a point slightly different from Earth’s center. This imaginary point is called the eccentric – the white X in the image on the left. 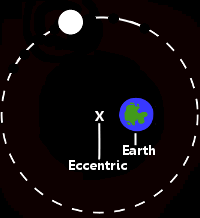 The effect of the eccentric is that as the heavenly body follows its orbit, its distance from the earth varies – sometimes it is close, sometimes farther away. Furthermore, for earth-based observers, the body’s orbital speed varies – something that had also been observed in practice. Of course, strictly speaking, the eccentric rather than the earth is now at the center of the universe – but the earth is still pretty close! The next idea was the epicycle and deferent. 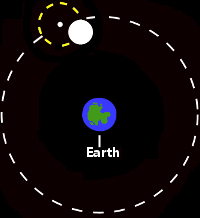 The epicycle is shown as the yellow dashed circle on the left. It is a small orbit around an imaginary point. This imaginary point travels around the deferent – the large white dashed circle centered on the earth – at a uniform speed. The epicycle is quite a neat idea. It allows the planet’s distance from Earth to vary and it also produces retrograde motion. 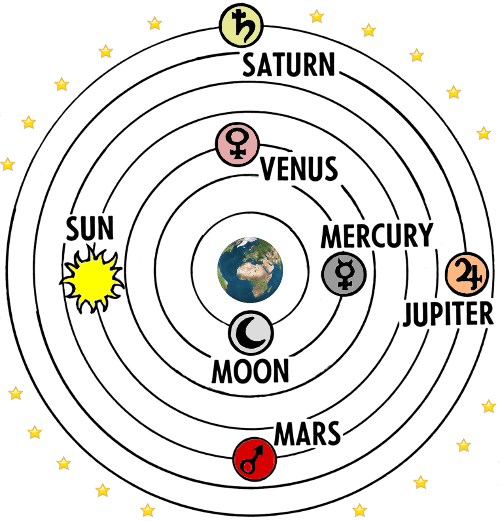 Ptolemy applied Hipparchus’s combined eccentric-epicycle-deferent model to the planets. He found that it did not work very well: it failed to predict the planets’ future movements or agree with their past movements. Ptolemy’s model of planetary motion. The red circle is a planet – Mars, for example. Ptolemy said the deferent does NOT move around the eccentric at a uniform speed. He added a different imaginary point – the equant – the white dot to the left of the eccentric on the diagram above. The equant is twice as far from Earth as the eccentric. Ptolemy said the deferent moves around the equant at a uniform speed. When viewed from the equant the center of the epicycle sweeps through equal angles in equal times. simultaneously moves at a uniform speed around the equant. Adding to the weirdness are three imaginary points that exist only in the mind of the mathematician: it is truly a work of magnificent sophistication. For the modern observer, with modern equipment, the predictions made by Ptolemy’s model are inadequate. In antiquity, however, all observations were made with the naked eye, meaning errors could be rather large. Given these circumstances, Ptolemy’s 150 AD model was rather good. It took almost 1,500 years for a clearly superior model to be found. We owe the superior model to Johannes Kepler, who discovered the laws of planetary motion after applying a brilliant mathematical analysis to Tycho Brahe’s superlative naked-eye observations of Mars. Tycho Brahe produced his own star catalog in the late 1500s. Brahe argued that the observations in Ptolemy’s star catalog were actually all made by Hipparchus 300 years earlier, updated by Ptolemy to account for precession of the equinoxes. Astronomers can now calculate the precise location in the sky of any heavenly body at any time in history. Ancient astronomers like Ptolemy, however, had only relatively crude instruments. The positions they reported for planets naturally had rather large errors. When modern astronomers evaluate data for the 747 BC – 150 AD timescale of observations used or made by Ptolemy, they find the positions he reported agree much better with his model than the true positions. The idea is expressed (very) loosely in the image below. The position Ptolemy reported for a planet was often suspiciously close to the position predicted by his model, rather than the planet’s true position. Scholars are split into two camps on how this should be interpreted. [The Almagest] has done more damage to astronomy than any other work ever written, and astronomy would be better off if it had never existed. Other researchers believe Ptolemy used genuine observations, but used them selectively, discarding any observations that did not support his model. Ptolemy may have thought he was doing his readers a favor by removing ‘bad’ data. He would not have been the only scientist to do this: Ronald Fisher believed Gregor Mendel’s approach to ‘bad data’ may have been similar. Nobody has (yet) written The Crime of Gregor Mendel. Scientific theories are refuted when no measurement confirms the prediction… selection of observation values is a very legitimate and even necessary step for the construction of complex theories. The astronomer Owen Gingerich theorized that Ptolemy used an undisclosed method to ‘correct’ his data. Whatever the rights and wrongs of Ptolemy’s methods, it’s worth stating again that it took almost 1,500 years for a clearly superior model to be found. The Almagest was a classic work of astronomy. Ptolemy also wrote a classic work of astrology. In four parts, it’s known simply as The Four Books. Often it’s referred to by its Greek name Tetrabiblos or Latin name Quadripartitum. It’s not surprising that Ptolemy was interested in astrology. For millennia astronomy and astrology went hand in hand – the great Kepler made ends meet by casting horoscopes: Ptolemy possibly did too. Ptolemy also wrote major works on the earth’s geography and optics. In Geography he used unreliable data to, not surprisingly, produce rather unreliable maps of the world. In Optics, Ptolemy described equipment to carry out experiments in optics and discussed his results – an example of ancient experimental science. Very little is known about Claudius Ptolemy’s life other than his works. Whether he married, whether he had children, and where and when he died are unknown. He died in about the year 170 AD, probably in Alexandria. "Claudius Ptolemy." Famous Scientists. famousscientists.org. 27 Aug. 2016. Web.